I love to have a bowl of creamy tomato soup after coming back from work specially in winters. It keeps me full until I prepare dinner and is always an healthy option to munching some oily snacks. 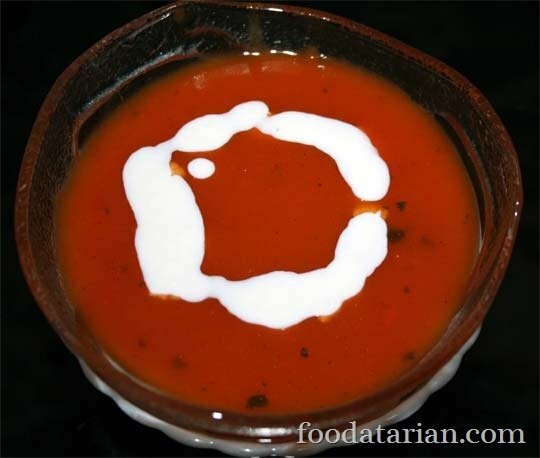 Here is a very simple recipe of tomato soup that uses only few ingredients. Cream to garnish and Croutons to serve. You can remove the skin of tomatoes and then cook them or cook them and then peel them. To remove the skin before cooking the tomatoes, place tomatoes into boiling water for 3-4 minutes and then drop them into cold water. Let them stand for 2 minutes. Then remove and de-skin them. Else cook them and then de-skin the tomatoes. For both the methods follow the same recipe from here onwards. Place the tomatoes in a pressure cooker along with 2 cups of water and cook up to 2 whistles. Remove from flame and take them out once pressure drops. Take them off and peel them if not done earlier. Let them cool down a bit. Then roughly chop them and place them in a mixer grinder. Grind them to a smooth puree. Strain the pulp if you wish so. But I use it as it to retain all the nutrition. Transfer the puree in a saucepan and put it on medium flame. Add more water if required. Season with salt, sugar, pepper and some mint leaves and bring to boil. Transfer to serving bowls, garnish with cream and serve hot with croutons. Feel like grabbing that bowl and enjoy that delicious soup..
Hahaha…thank you so much Priya! Very nice photograph.. Oh I am hungry now! !